A friend of mine told me once, ” How you exit one thing will determine how you enter another”. As we leave 2011 remember to do it with dignity, grace and a good healthy sense of humor. 2011 might have been a real challenge for a lot of us but the fact of the matter is good has happened and you are still moving forward. If 2011 was a year of TRIAL & PRUNING then 2012 can be a year of NEW LIFE & GROWTH. It has been said that for every door that closes, there is a new one that opens. That being said, Then knowing how we leave one thing will greatly effect how we are going to enter another. 1. Don’t enter a NEW year with OLD negative attitudes. 2. Look forward to another opportunity to get it right. 3. Last year’s words belong to last year’s language – Learn a new language of hope of and some new words in 2012. 6. New Year’s Day is every man’s birthday. 7. When it comes to New Year’s resolutions; Integrity – the ability to not promise something you can’t come through on. 8. It’s O.K. to have a new definition of success. 9. Keep up with technology. 10. FORGIVE – It will keep you moving forward. 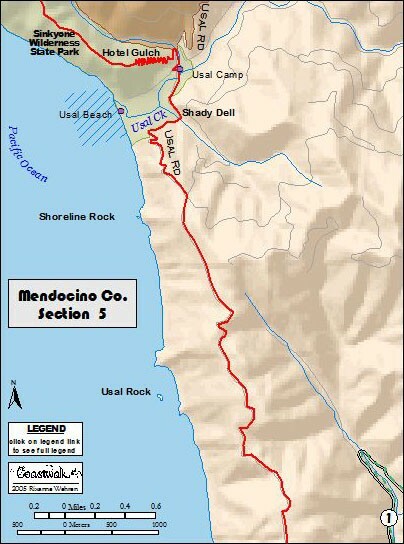 Biking sections of the California Coastal Trail gets put on the list. Its time to start investigating what sections of the CCT to ride in the next couple of years. 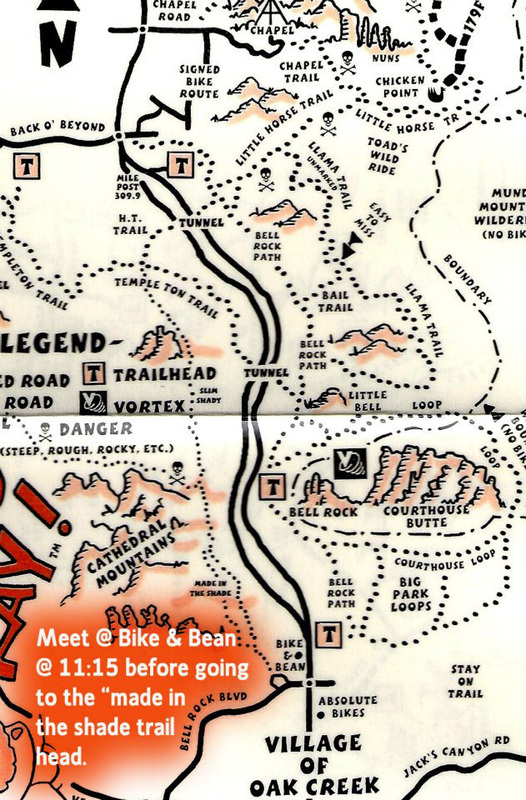 This page of stevelummer.com will be dedicated to mapping that route. 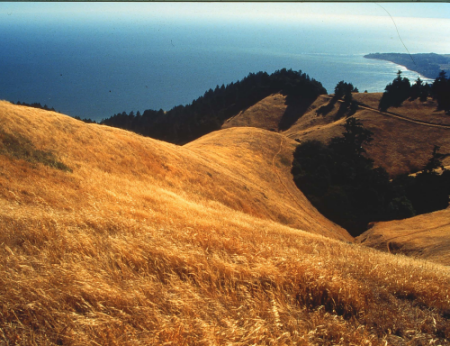 The California Coastal Trail (CCT) is a network of public trails for walkers, bikers, equestrians, wheelchair riders and others along the 1200-mile California coastline. It is currently more than half complete. 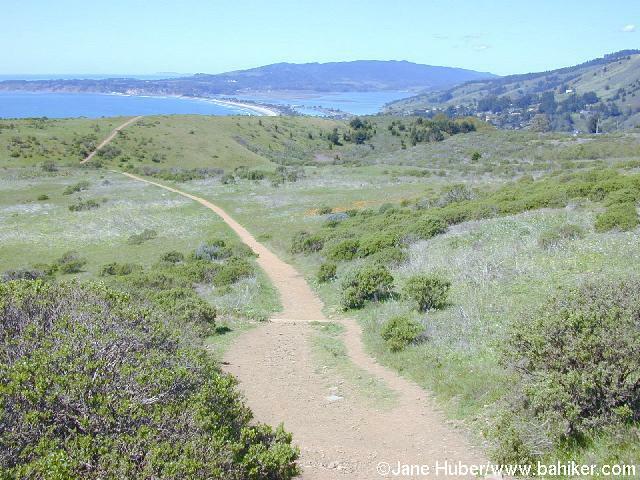 Coastwalk California is a volunteer organization that advocates for completion of the Trail. 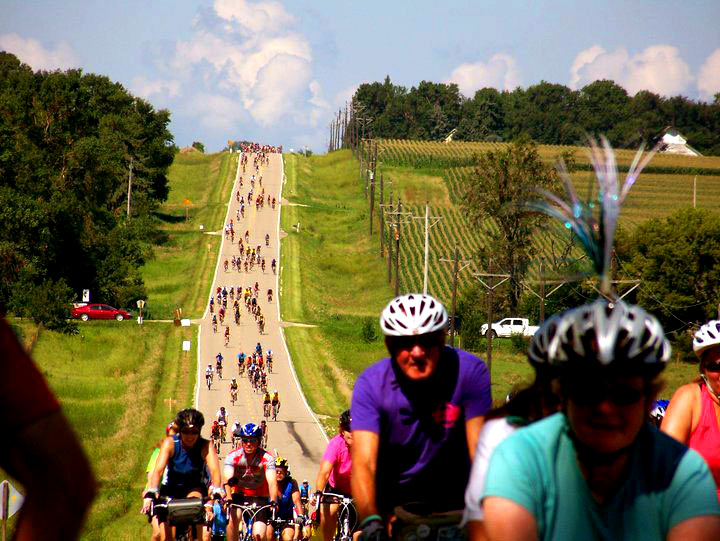 A section of the CCT in Marian County. Now for the research and development of these trips. 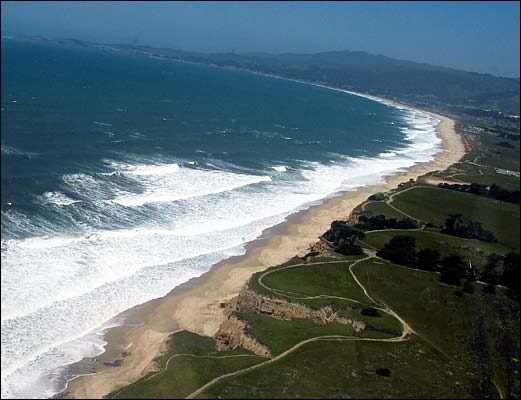 Yes, this is what I am talkin bout. 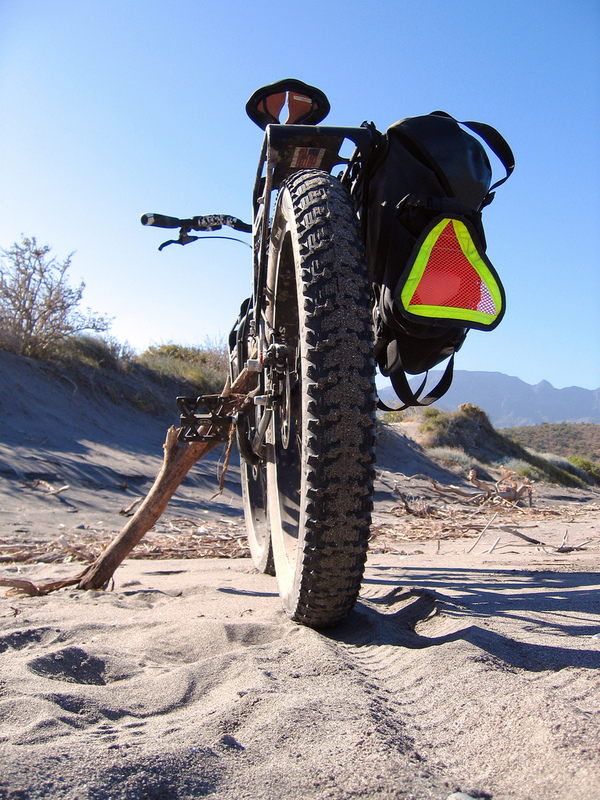 The options are plenty – Bike Packing, Travel trailer or travel by SUV and hotel it. I prefer one and two. Pics for follow from the CCT. 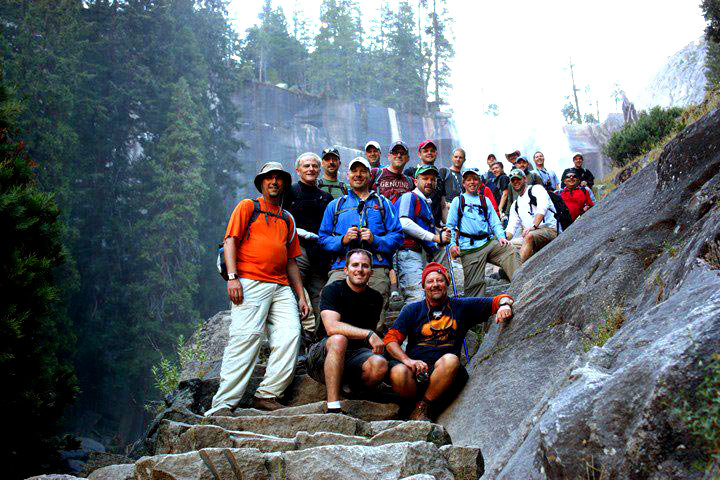 Over the past 30 years I have been privileged to lead and be on some amazing adventures with some amazing people. From deep sea fishing with my wife in the Pacific Ocean / mountain biking in Mexico, the Iditirod trail in Alaska and Arizona / climbing Half Dome in Yosemite / fishing the amazing waters of Canada / getting to Espejo Peak in the Venezuelan Andes @15,633 ft / scuba diving and canoeing the Ozarks / hiking into the Grand Canyon or riding a bike across Iowa … all of these adventures had one thing in common. Friends to enjoy it with. It is amazing how you get to know someone when you get out of your routine. 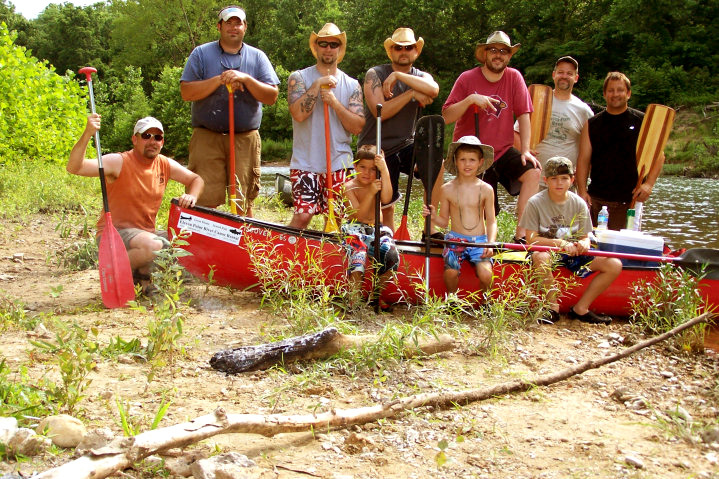 Being in the outdoors helps open doors to new and lasting relationships with family and friends. When John Muir said; “most people live on the earth not in it”, I think he nailed it by describing how easy it is to miss an amazing place called planet earth. We live on the only living planet in the universe, (that we know of), with 7 billion other people. What a shame to miss out on the greatest gift in the universe, people and the planet we live on. The adventure is great! But it is amazing when it is experienced with people of like hearts and passion. If you are reading this blog, you are a member of an elite group. A group of adventure types that love being outside the walls of a mall or structure that has your view clouded by ceilings and walls. Church settings are nice but the roof is to low. God took Abraham of the Old Testament outside his tent and told him to look up at the stars in the sky and God told him that his offspring would outnumber the stars. What God did is just as significant as what he said. He led Abraham outside for an object lesson that he would never forget. Why did God take him outside? Because inside the tent, Abraham’s vision of God and God’s amazing future for him was limited. He could not see the potential of God’s promises displayed against the backdrop of God’s creation. God wanted him to get a glimpse of just how big a God he was. Taking Abraham outside was God’s way of telling him not to put limits and ceilings on what God wanted to do through him and for him. 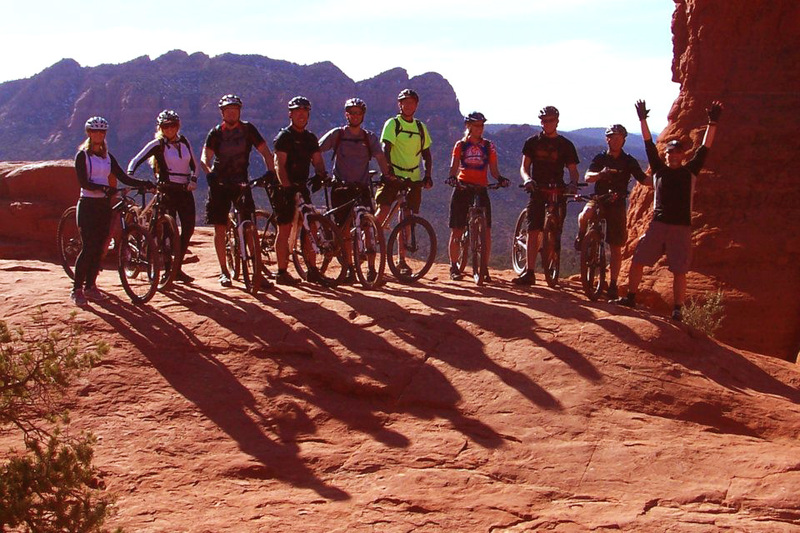 Get yourself outside yourself and mix it up with some good friends or good strangers for a change…. Get outside and adventure yourself. Here are a few opportunities we are putting together over the next year for you to connect through some amazing adventure trips. 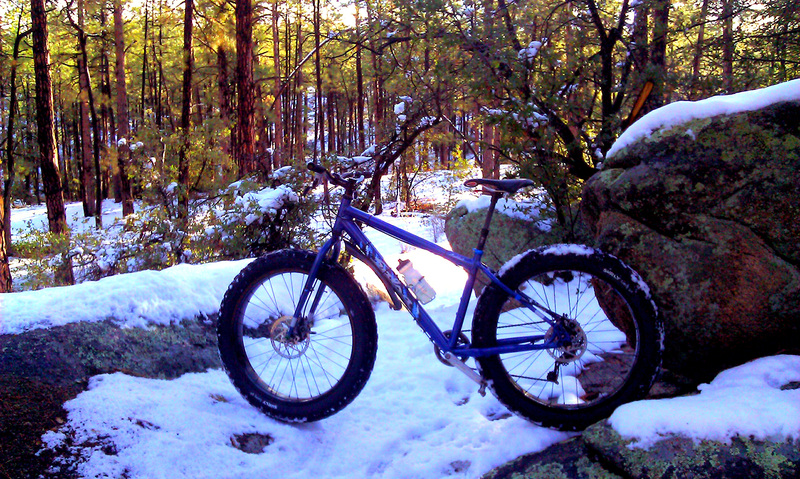 A friend of mine let me use his Salsa Mukluk Fat tire bike for a couple of days while we have snow here in Prescott. In our neck of the woods we still have about five to six inches of the frozen H20 up in the pines. 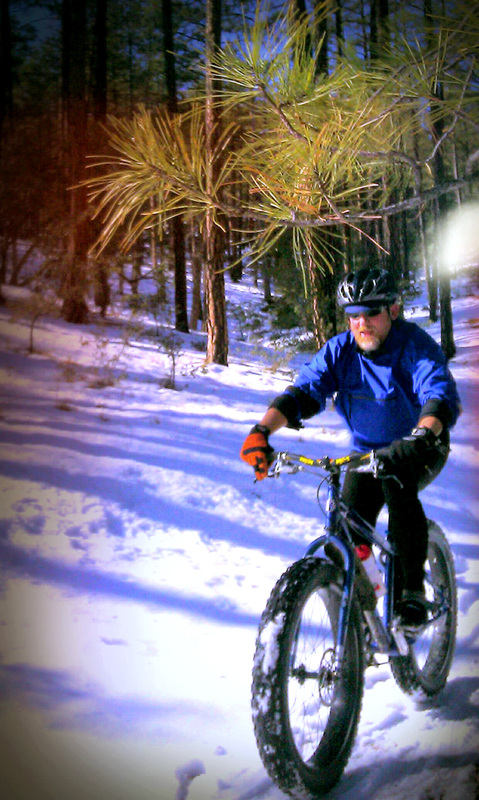 I wanted to test ride the fat tire bike to see how she does in the deeper snow before I actually pull the trigger and get one. 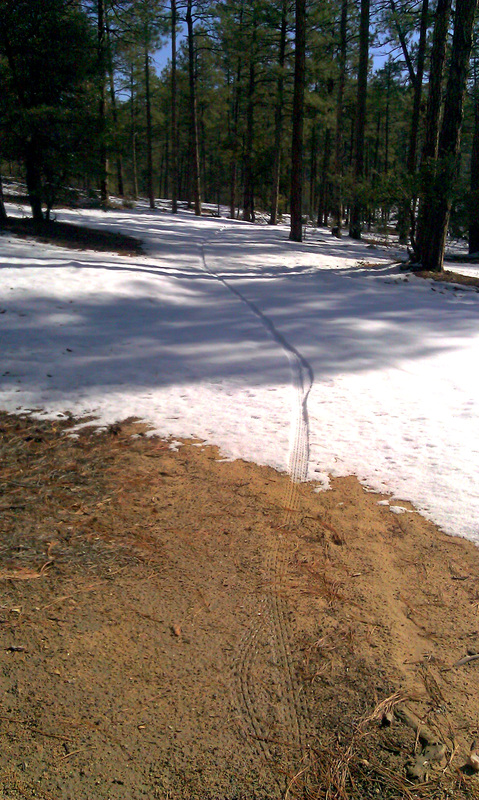 When going up any incline with deeper snow you really need to have some momentum and legs. 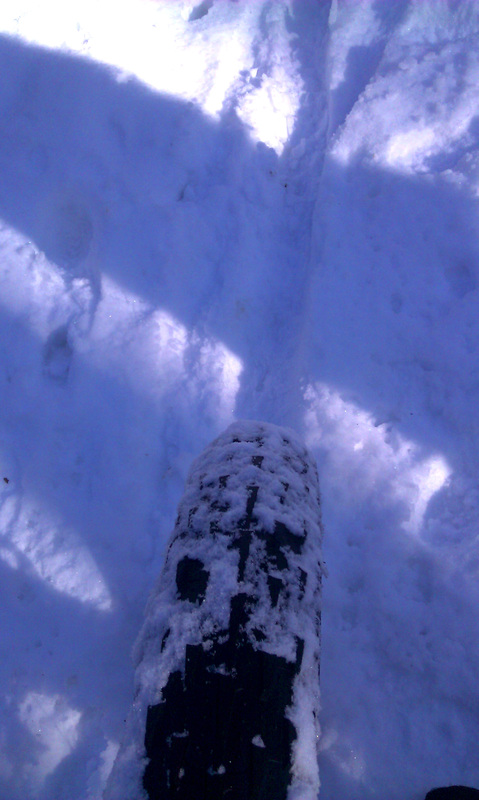 The fat tires do actually get through snow pretty good. 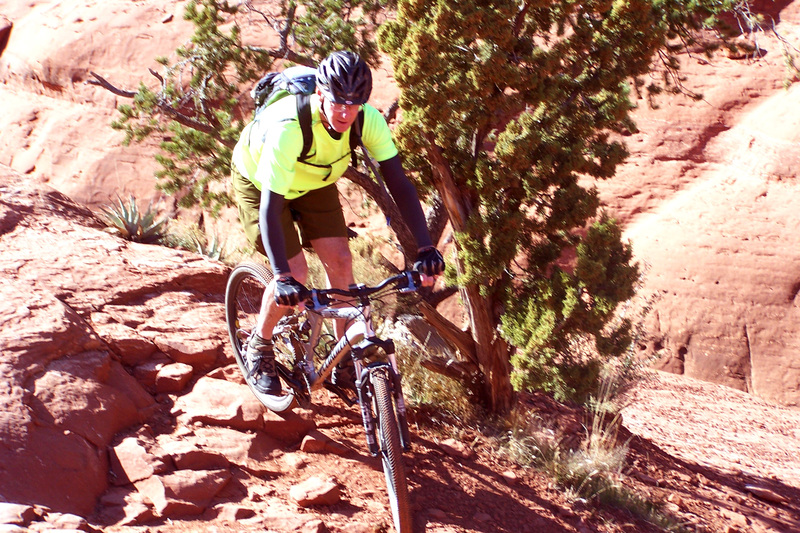 The 82mm rim/3.8″ tire combo was created to go where standard “all terrain” bikes flounder. 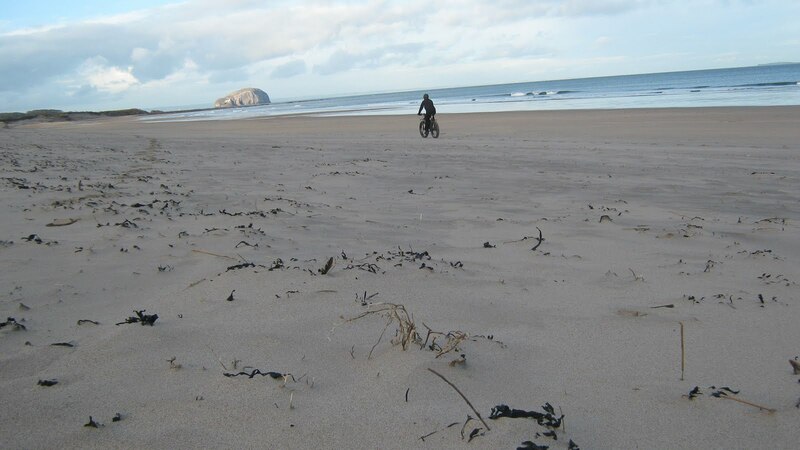 The floatation and traction afforded by large-volume, low-pressure tires can get you over and through otherwise unrideable terrain…sand, mud, wet rocks and roots, ice and many kinds of snow. 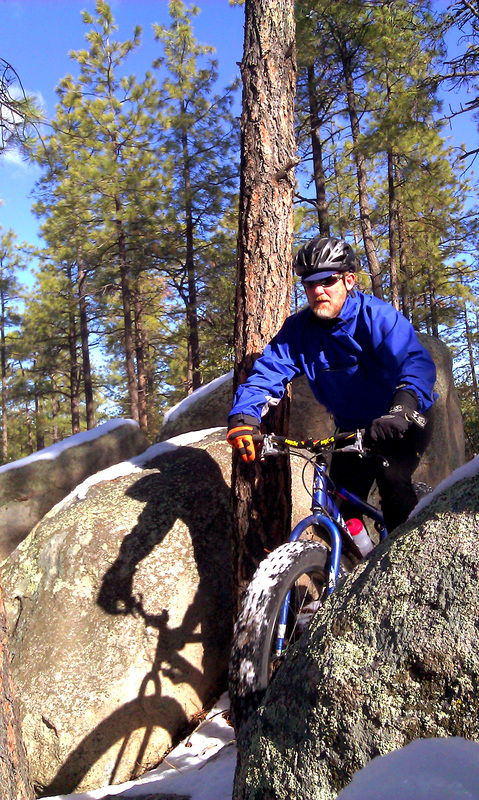 The Mukluk on John’s bike is a 1×9 and does well in most snow conditions. The ideal snow level is in my opinion 1- three inches or a mix of decomposed granite/mud. 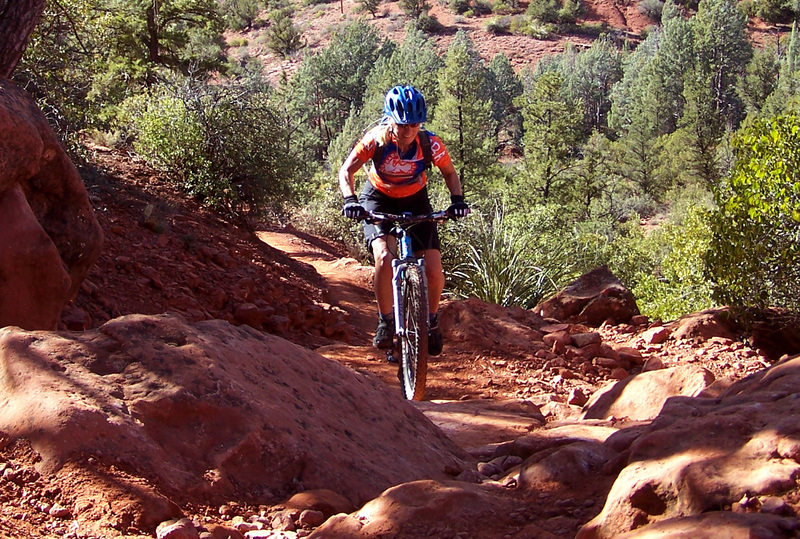 The fat tire is a great option for riding when a conventional mountain could not cut it. 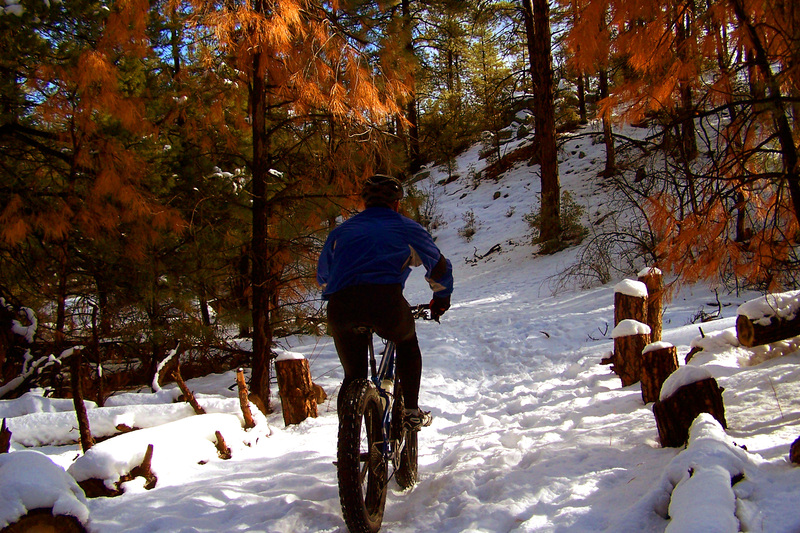 – I think for the money FAT IS WERE IT’S AT….to give you another riding opportunity in rain/snow and slightly muddy conditions. 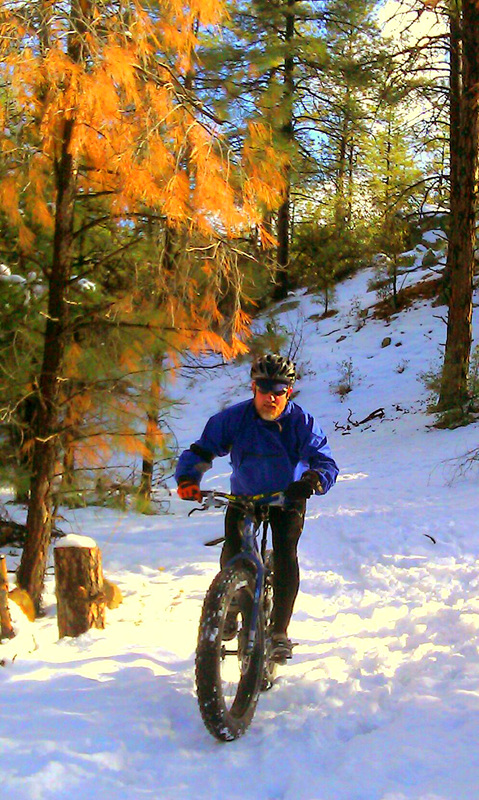 I loved having the option to get out on the snowy singletrack and not having to sit on my bike in the garage for another boring spin video. 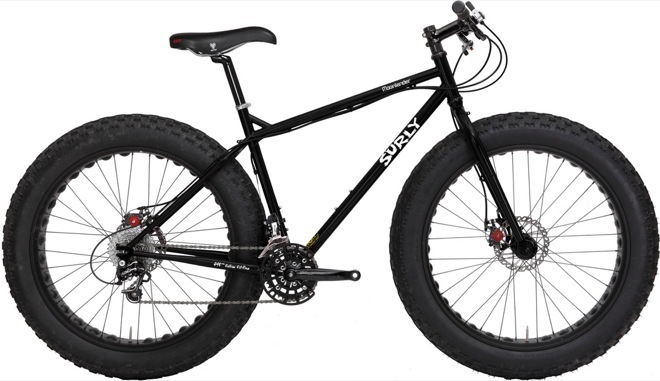 The actual fat tire bike I am looking into in the Surly Moonlander. 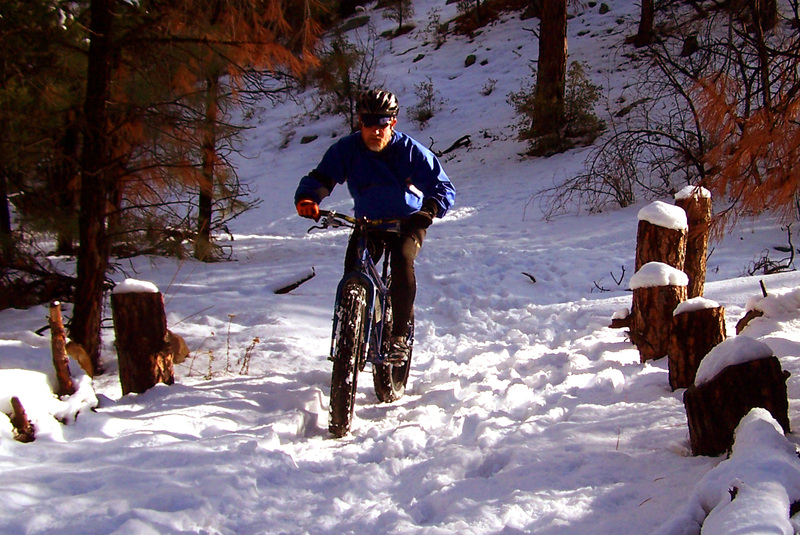 It has even a wider bigger tire for getting you through snow with better traction. 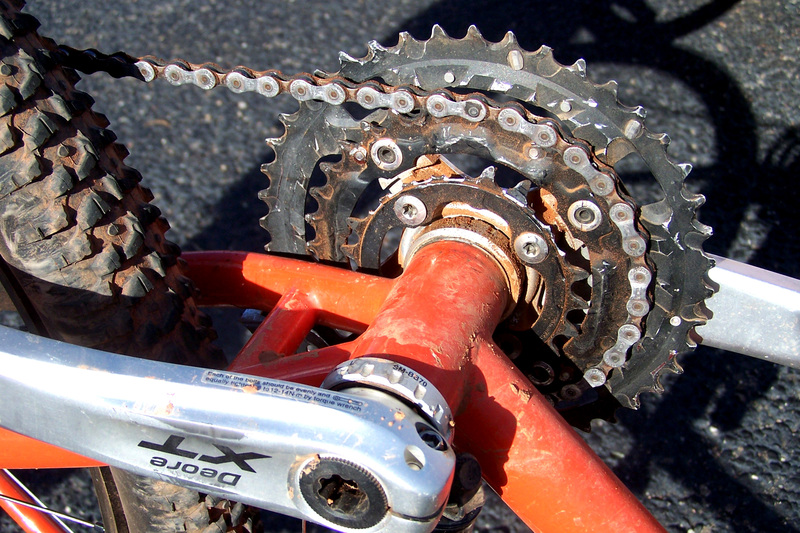 Here is the beta on the Moonlander from Surly’s web site. 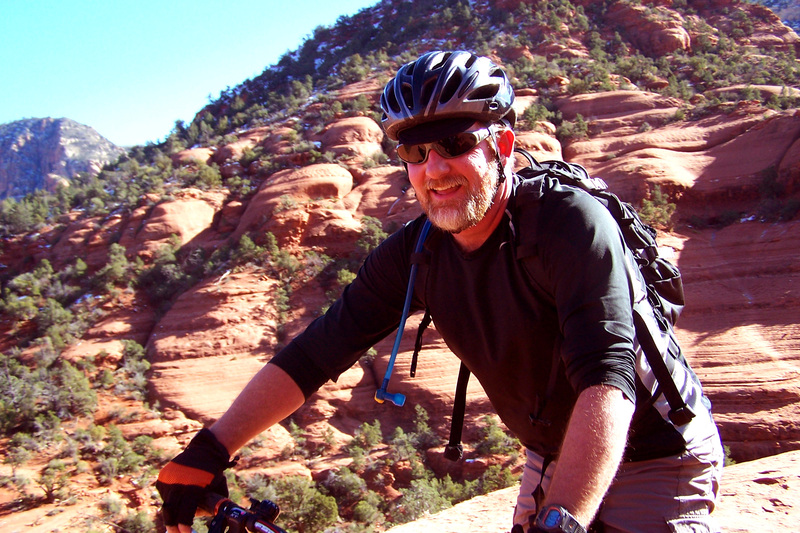 I just wanted to share a few pics of our December 2011 Sedona mountain bike adventure. 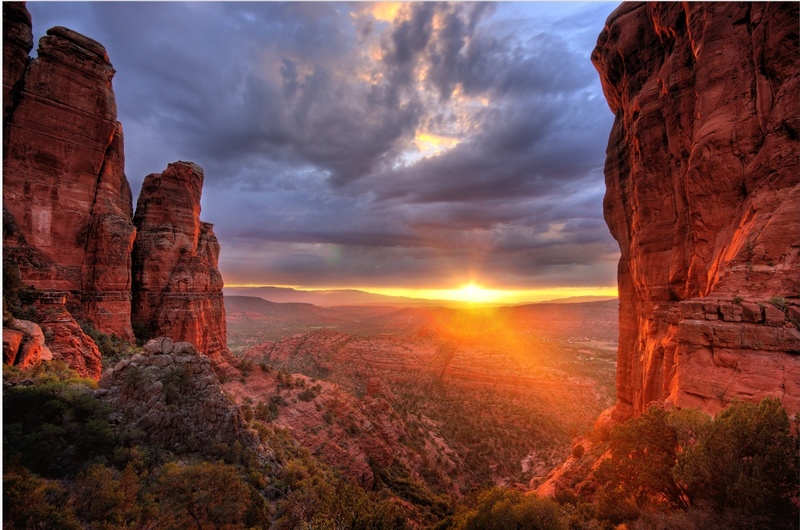 Sedona is one of those treasures that keeps you on a quest to discover more each time you visit. 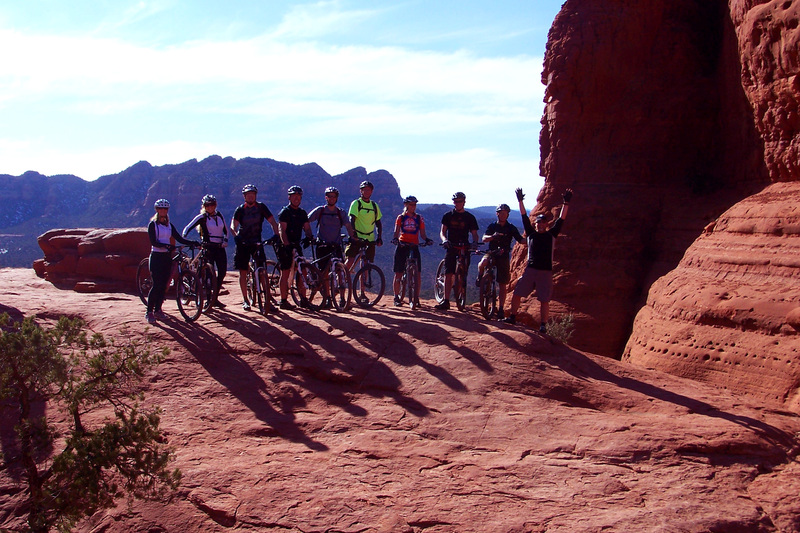 The plan was to start at the “made in the shade” trailhead and get to chicken point and then back to the parking lot. Here is a map provided by Cosmic Ray. 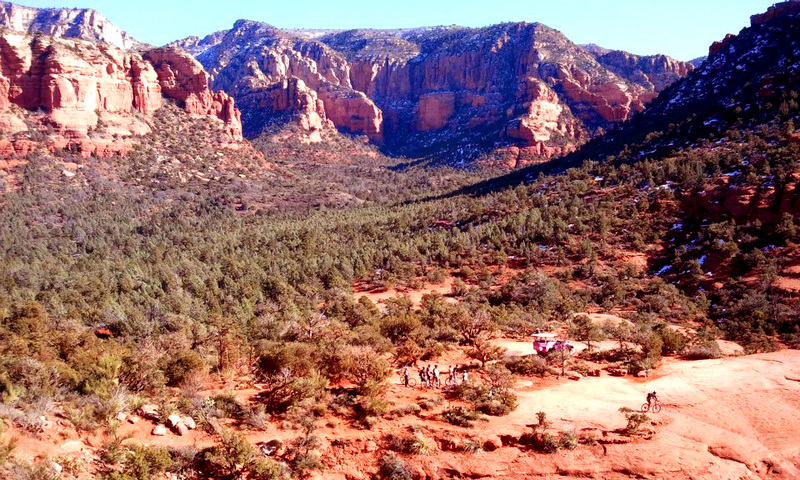 The actual route we ended up taking was: Made in the shade” – “Slim shady” – “HT” – “Little horse” – to Chicken point – Llama – “Little bell loop” – Bell rock loop and back to the parking lot. The “made in the Shade/Slim shady section in one of my favorites. 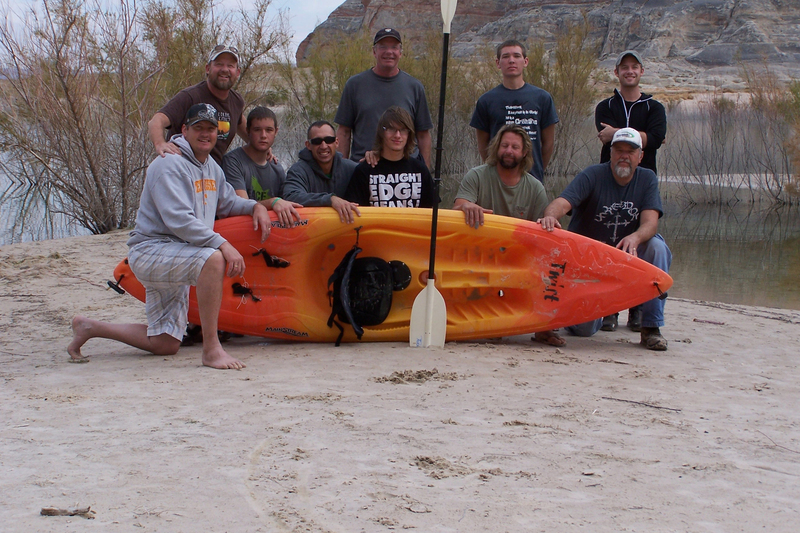 Here our group stops for a photo op. 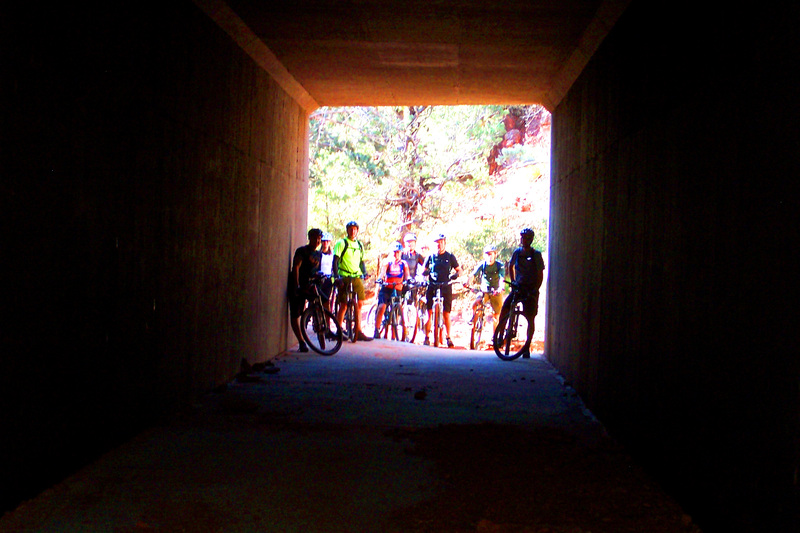 The “HT” (highway tunnel) trail travel under highway 179 and over to the Little Horse trail. No one cleaned this section but they gave it a good try. 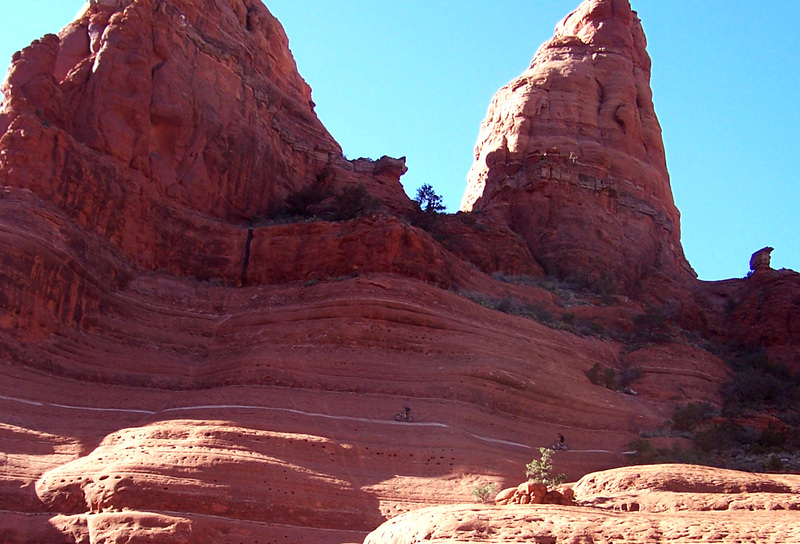 Chicken Point is a destination and point of interest for hikers, Jeeps and mountain bikers. 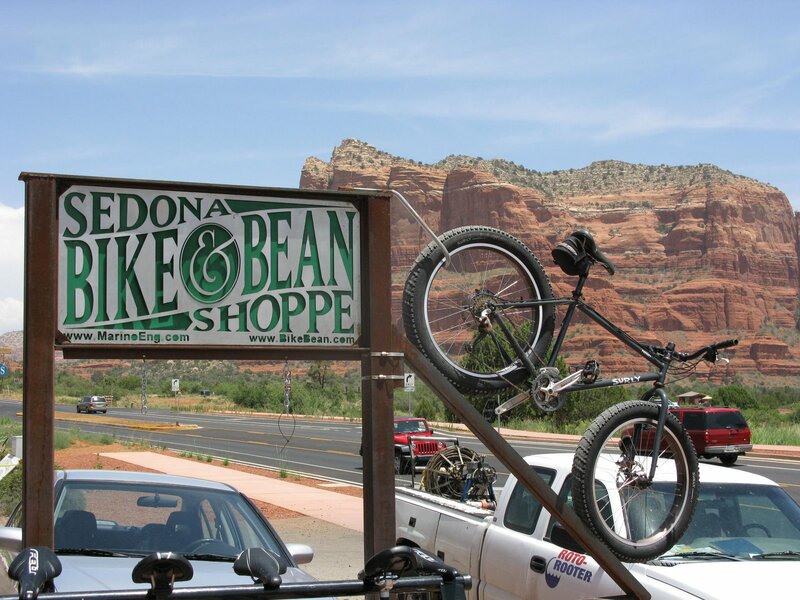 The views are amazing and give you a “back country” view that most Sedona visitors don’t experience by traveling up and down the main roads and tourist shops. 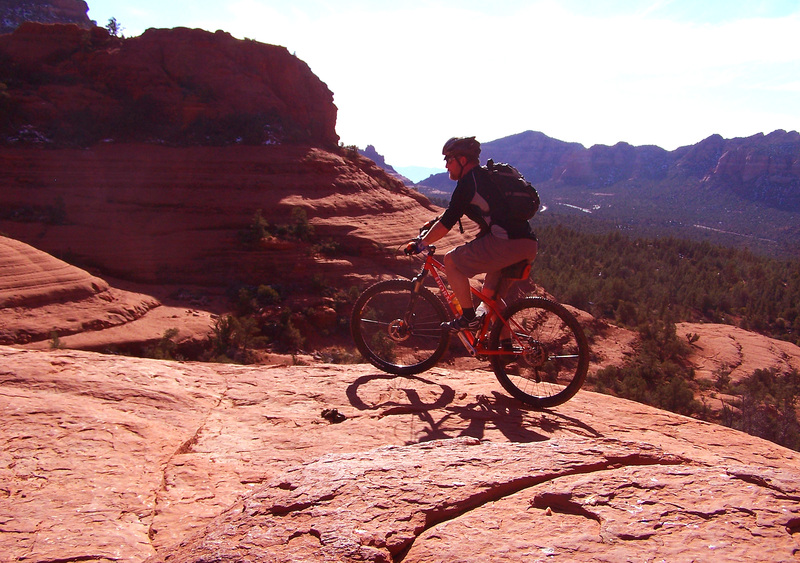 Chicken Point is a playground on the hidden side of Sedona. The “white line” is not really a shelf ledge …. 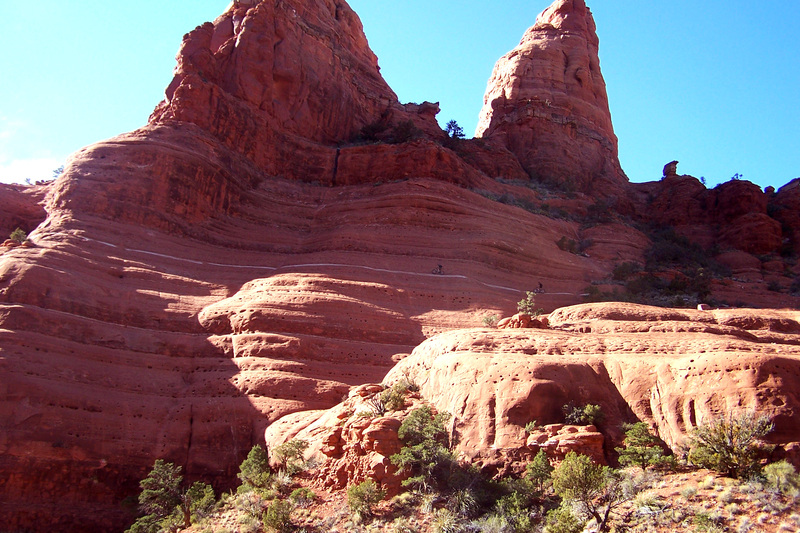 but rather according to Rob H. more like just a sloped part of the rock formation that is “steeper than it looks”. Here is a youtube video of the entire “white line” by a couple of crazies. The entire day was awesome with the exception of a mechanical small ring failure on the way back to the cars. 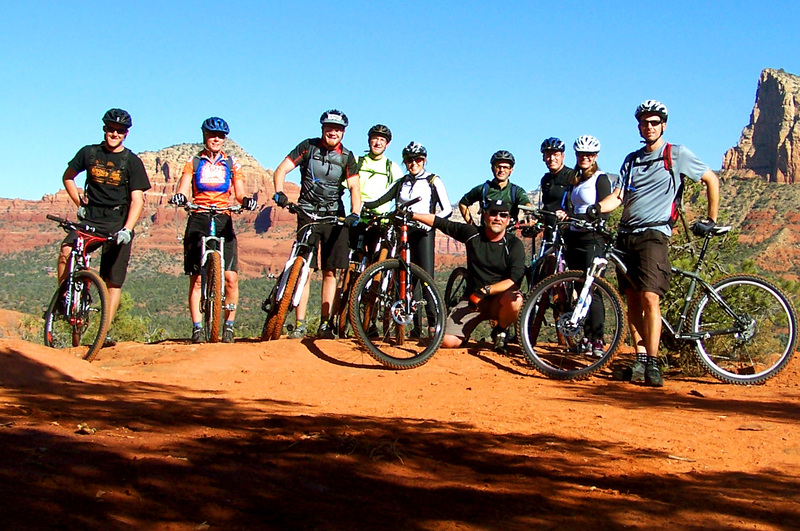 Looking forward to getting back to another Sedona adventure real soon.